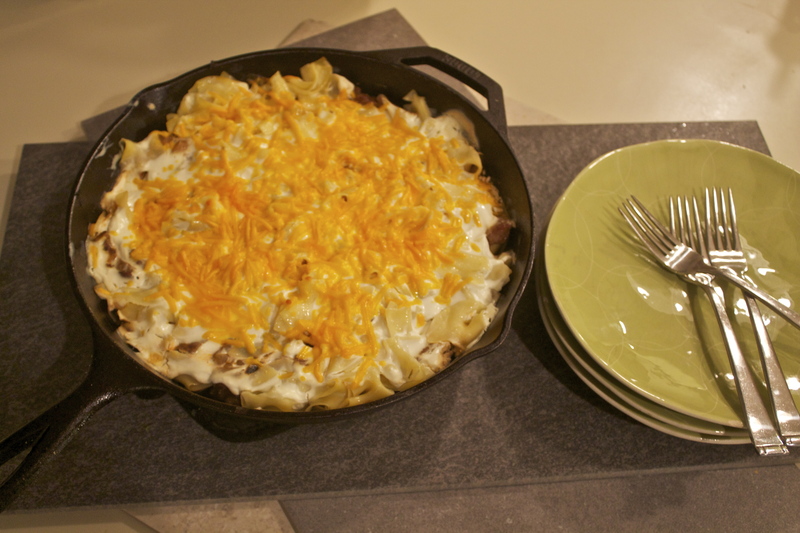 Sundays and Comfort Food frequently go hand-in-hand, at least in my kitchen. This skillet pie is relatively easy and only takes about 20 minutes prep time, with another 10 minutes in a hot oven so all the flavors meld together. I prefer my steak to be medium rare, so the steak is quickly browned on the stove before adding to the pie, and then finished off in the oven. Don’t overbake or the steak will be tough. Boil water and cook noodles per package directions in salted water. I prefer to use Pappardelle noodles, which are flat ribbons of pasta you buy either fresh or dried (I used dried). 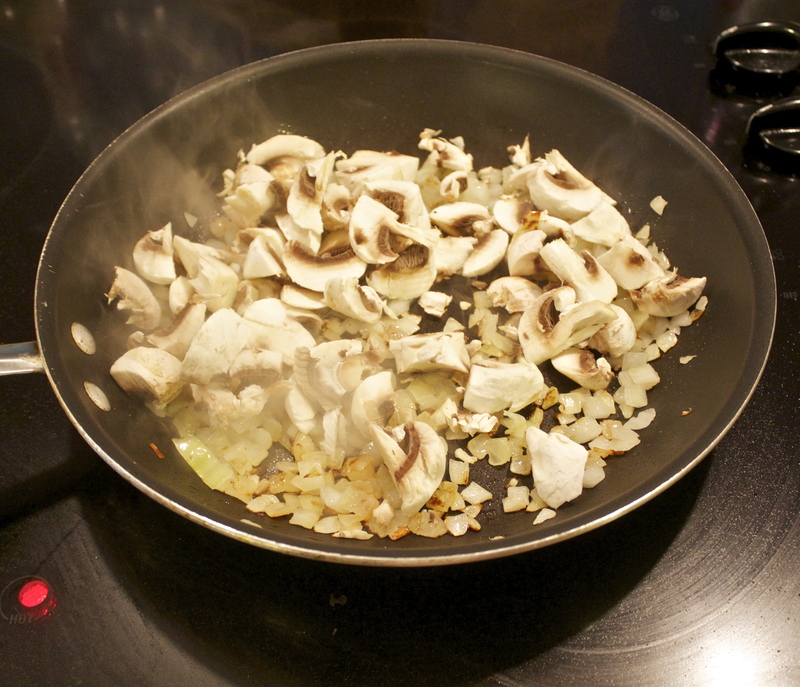 While the noodles cook for 10 minutes, add a small amount of olive oil to a non-stick pan and add the diced onion, garlic, salt, water chestnuts, and mushrooms. Saute till they start to brown and add in the 3 sprigs of Thyme (gently remove the herb with a quick “whoosh” down the stem.) 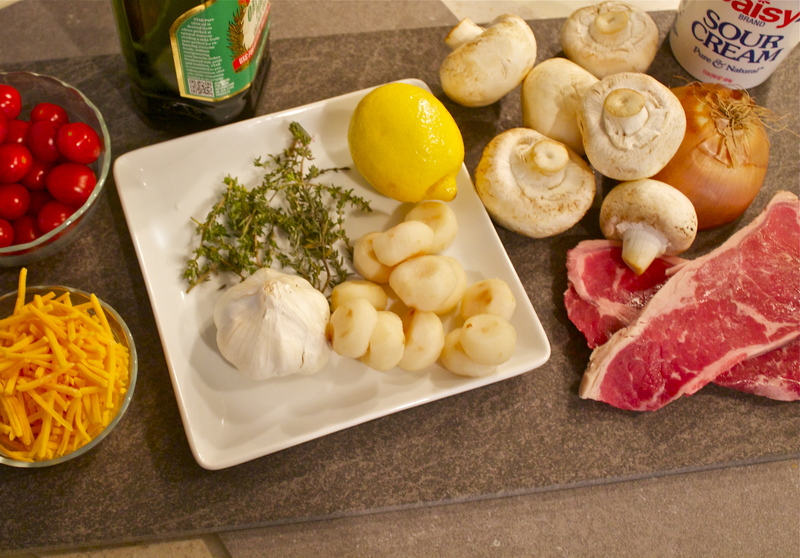 Add the Thyme, lemon zest and Cognac to the mushroom mixture and cook for about one minute and then remove pan from heat and set aside. The mushroom and onion/garlic combo smells amazing! After you add the Cognac I want to stop and pour it over french bread and eat it right then! Lightly salt the steaks on each side then slice into thin strips (same as if you were making Stroganoff). Quickly brown the strips in a little olive oil in same pan. You want to get the strips brown on outside, but still raw on the inside as you will bake the pie later. Drain the cooked noodles and add 2/3 of the noodles to a cast iron skillet that you have added a small amount of olive oil and 1 Tbl of butter. Brown the noodles, same as if you were making hash browns – you want to constantly turn the noodles so they are crisp, but don’t burn. You now have your bottom “crust” of the pie and start to build the pie from here. Place 1/2 steak strips on top of the noodles, add a layer of mushroom mixture, and the grape tomatoes (I quickly slice them into halves). Add the remaining noodles on top, 2nd layer of steak strips, remaining mushroom mixture and then spread the sour cream on top of this layer. Toss the shredded cheese on top of the entire pie and bake in a 400 degree for 10 minutes. Thanks Cindy! Let me know what you think when you make it. Looks good. I will try it but need to cut down on the size. Only me here now since my darling died two months ago. Thanks – and sorry to hear the Architect has passed. Had not kept up reading too many blogs these past few months, so didn’t realize he was sick. Blessings to you as you move forward.